Everyone Drops Their Chopsticks: A whole new world...beginning with books. A whole new world...beginning with books. Among the meetings with fellow faculty members, participating in seminars, writing lesson plans, anticipating, parading in front of yet another audience of people to be introduced as the "direct imports from America" (obviously still in America, date of exportation will be the end of March) there is much reading to be done. 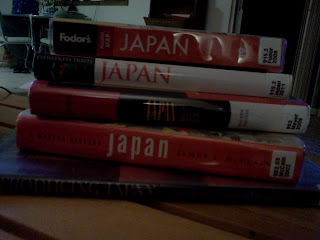 On my coffee table at this moment there are 5 books about Japan, two of them are actual travel books because there is quite a bit of really good information in most of them and each has their own particular feature that is better than others. Currently I have the DK Eyewitness Traveler (great photos and section by section information on the country) and the Fodor's ( honestly I haven't read this one yet). The only other travel book I've looked at was the Lonely Planet guide before I left for our 2 week trip to Japan in June. That book had some great information about cultural traditions to be observed if you don't want to look like a clod. I also have two history books on Japan "Japan: A concise history" by Milton W. Meyer and "Japan: A Modern History" by James L. McClain. Why two different history books you ask? Something you should know about me, I approach history spherically. One source is never, ever enough. Believe it or not, these books are actually not dry! I know you won't really believe me if you don't know me, but for those of you who do, as a social studies teacher and fan of history and reading, you know I like a read that moves along. The day I begin to rely on one source will be the day....nope, that will never happen. The last book I have currently is "Introducing Japan" by Donald Richie, which is more a coffee table book, but it too has some wonderful pictures and additionally has useful and interesting text to accompany them. I knew that learning about Japan was going to complex and a process. The history of that country doesn't span a couple centuries, it expands through several millennia! I might feel it is a daunting task but I am not kidding myself, I'm not going to learn all of it, I simply want a better understanding of the long history of the country and how their culture was born. I look forward to making it through these books, I'm moving slowly but enjoying it immensely.